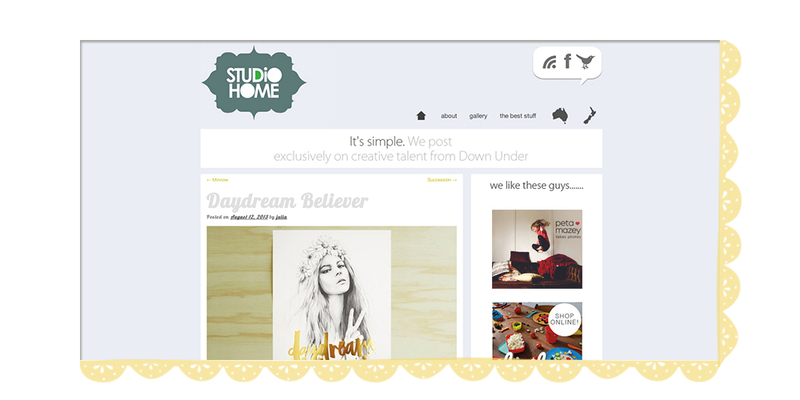 Studio Home: if you love The Design Files, you will love this blog...in fact from memory I think their interview with Lucy was how I discovered them. My dedicated regular reading was pretty much sealed when I found their post about Ink & Spindle. Now a staple on my Instagram feed, my love of `behind the scenes' type posts is most definitely boosted after visits here. Their tagline reads `It's simple. we post exclusively on talent from Down Under' (meaning Australia and New Zealand)...that pretty much says it all. The best part about it being mostly local (for us anyway) is we've had many years of browsing delicious design eye candy from all over the world...which is great, but if you want to own a piece of that eye candy it's not always straight forward. Shipping to Australia is expensive, some places won't even consider it...it's just nice for we Aussies and Kiwis to know that what we're seeing here is stuff we could most likely trot off to buy...and places we could visit in person. Love your work Julia! Keke: Kirra's blog has such beautiful photography...especially food photography which, inspired by her time spent in Tokyo, includes recipes that I may not have come across if it weren't for following along. Her posts often include stories behind the food....like maybe who the recipe was passed down by...and stories/photos about where it's prepared.So you're not just peeking into the recipe itself, it's a little window into the life surrounding the food. The Pumpkin Bee & Pollen Cake is my absolute favourite...for the colours, the spaces in between, the way everything is laid out as individual components...and that bee pollen is an ingredient I'd never heard of before reading. The fact that the dogs living in the homes where the recipe comes from are also often photographed is a sure fire way to keep me reading....I hope you love it as much as I do. Daydream Lily: This is one super popular read that for some bizarre reason I have missed on my radar until just recently. I love Liss' fashion and photgraphy style...the fact that she often experiments with different cameras and film. She also travels to places I am yet to find myself (Auckland I'm looking at you!) and posts finds that are the exact type of things I would likely seek out if I found myself in the same city. Case in point: I am now craving Auckland's `Best Ugly Bagels' as a direct result. She has collaborated with the likes of Element Eden and Frankie Magazine. Obviously I'm a bit late to the party on this one, but sometimes that's not a bad thing as I've got a lovely bunch of design and fashion inspiration archives to catch up on. It seems I have unintentionally followed a theme today...all three finds have direct link to The Design Files...just goes to show that wherever loveliness is created...Lucy has probably found it also :) So...with that said...here's Liss' sweet home tour. An international thriller, The Expats is the story of a seemingly ordinary working mom, Kate Moore, whose husband, Dexter, is offered a lucrative job in Luxembourg—a move that will unravel everything they believed about each other. Kate and Dexter have struggled to make ends meet, so they jump at the chance to start a new life abroad with the promise of rich rewards. But Kate has been leading a double life, and leaving America forces her to abandon her dangerous but heroic job. She soon discovers that it will be harder than she thought to shed her past, especially while coping with the weight of an unbearable secret. Dexter seems to be keeping secrets of his own, working long hours for a banking client whose name he can’t reveal. When another American couple befriends them, Kate begins to peel back the layers of deception that surround her, revealing a heart-stopping con that threatens her family, her marriage, and her life.